In the 1970s, the best way to show a thaw in relations between the world’s superpowers was a meeting in space. In the 1970s, politicians started using a previously unknown expression: “international détente.” The world’s two superpowers, the Soviet Union and the United States, were preparing an agreement on security and cooperation in Europe, and they had to find a symbol for cooperation. It was then that the idea of a joint Soviet-American space flight came into being. 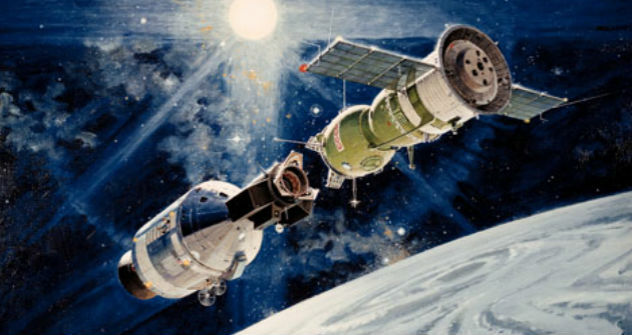 The Apollo–Soyuz Test Project (ASTP) took place from July 15-21, 1975. The participating Soviet cosmonauts were Alexei Leonov, Valery Kubasov and, from the American side, astronauts Thomas Stafford, Donald Slayton and Vance Brand. “President Richard Nixon shared his idea of a Soviet-American flight with Alexei Kosygin, who chaired the Soviet Council of Ministers in the 1970s. The Soviet-era Ministry of General Engineering, headed by Sergei Afanasyev and also responsible for space and rocket technology, made the initiative. Soon, in the summer of 1973, we went on our first training session in Houston. We first came to the United States, and then they came to the Soviet Union; there were several such trips. The bulk of out time was spent on simulators and in the evenings and on days off, we went out and visited our American colleagues. When our American friends visited us, it turned out they knew just as little about us as we did about them. They could not hide their surprise that we had more than just snow and bears. It never snows in Houston; that is why they liked it so much in Star City, making snowballs during a thaw and pelting each other with them. Our food was to their liking too. Tom Stafford especially loved the borshch at the Cosmonaut Training Center cafeteria. The astronauts visited our homes regularly, too. We cooked shish kabob and rice pilaf and sat in the street under an awning. We had to learn how to understand each other. Finally, it was time to fly. Soyuz blasted off first. It was only after the first correction of our orbit that the Americans were to launch the Apollo. Yet, the ambitious project might well have been derailed at the last moment. As the Soyuz was on the launch pad, problems were found in the telesystem’s switching center. This could delay the launch for a day, but the entire world was waiting for the start on schedule. Minister Afanasyev said that the launch decision had been made and there was no going back. It was only after we entered the near-earth orbit that we received instructions from the flight control center on how to fix the telesystem. But we had very few tools, just a screwdriver and pliers! What saved us was a hunting knife that Leonov bought before the flight at a military store. It took us the whole night, but we fixed it. After we docked together, our American colleagues asked us: “Why are you so sleepy?” “You seem just as tired,” we answered. And right we were: We later learned that their switching, docking hatch got jammed, and they spent the whole night fixing it, too. The Apollo was to play the active role in the docking operation. It was launched seven-and-a-half hours after us, and its astronauts saw our Soyuz from 370 kilometers (230 miles) away. The schedule showed that the docking was to take place over the Soviet Union and be broadcast live across the country. Instead, they hovered over Spain, where the communication point with the U.S. control center was located. Tom Stafford reported: “All is going as planned, the hovering is complete.” And he received the command from Houston to “go ahead with the docking operation!” Stafford began to approach us, and what were we to do? Stopping it would have meant an emergency. So we decided to go on. After 19 hours 9 minutes and 9 seconds, the vehicles made contact. Three minutes and one second later – they docked. And, by some mystical coincidence, it happened over [the island of] Elba, where our fathers met their American allies in 1945 as they were liberating Europe from the Nazis. It is also worth noting that the closer our project was to being implemented, the more our American colleagues offered to have the historic meeting on board their vehicle. They were very inventive and came up with a pretext, saying that their radio cable for the earphone headsets was too short. They were clever guys, but we outdid them. Our guys said: “Give us your cable, we’ll extend it.” But they didn’t give up. When both the Soyuz and Apollo hatches were opened, Stafford began to call us over into their ship. But we said: “E-e-eh, no! The schedule shows that we are to host you guys, so come on over!” And our American friends came in. Alexei literally pulled Tom by the hand into the Soyuz. Finally, we started shaking hands and hugging each other. Our meal together was planned in advance, with everything in tubes except Borodinsky bread. Suddenly, Leonov started handing out tubes with Moscow Vodka stickers on them. He said: “Russian vodka... is a very big Russian tradition!” The American guys were transfixed on the spot, despite the weightlessness. They opened them up, and inside was… borshch. Alexei, who was quite the joker, brought the vodka stickers with him for fun. But the Americans were upset – they “broke” the rules. No one, however, would believe them back in Houston. There was a lot of hype around our flight. And indeed, we carried out some very interesting experiments. For the first time ever, we simulated a solar eclipse: the Apollo blocked out the sun, allowing us to examine the corona through a special looking device. We measured the concentration of atomic nitrogen and oxygen in space. We studied the biorhythms, how weightlessness influences the crystal-chemical and metallurgical processes in semiconducting and metal materials. We maneuvered a lot using manual control. To confirm our vehicles’ capability, we carried out another docking on July 19, this time with Soyuz as the active ship. Our joint flight lasted 46 hours. After the second undocking, when our vehicles were flying close to each other, I suddenly heard Stafford’s voice in the earphone headset: “Valery, I can see you in the window.” Tom was a real professional.